We're not expecting the huge, game-changing, brand-new mobile operating system and phone that we got last year at the Consumer Electronics Show. You know, the gigantic unveiling of webOS and the Pre. 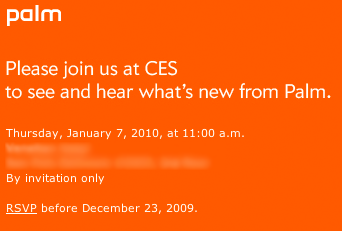 Still: good to know that Palm has something planned for CES. We hope it's pretty big. We'll be there, stay tuned.